Incoming freshmen who want to major in engineering will be able to apply directly to the University of Washington’s College of Engineering starting this fall, a move that will give students more certainty about their major. Starting in spring 2018, the University of Washington will begin admitting incoming freshmen directly into its highly competitive College of Engineering, one way to lower the growing pressure on students vying to win a seat in the coveted engineering school. 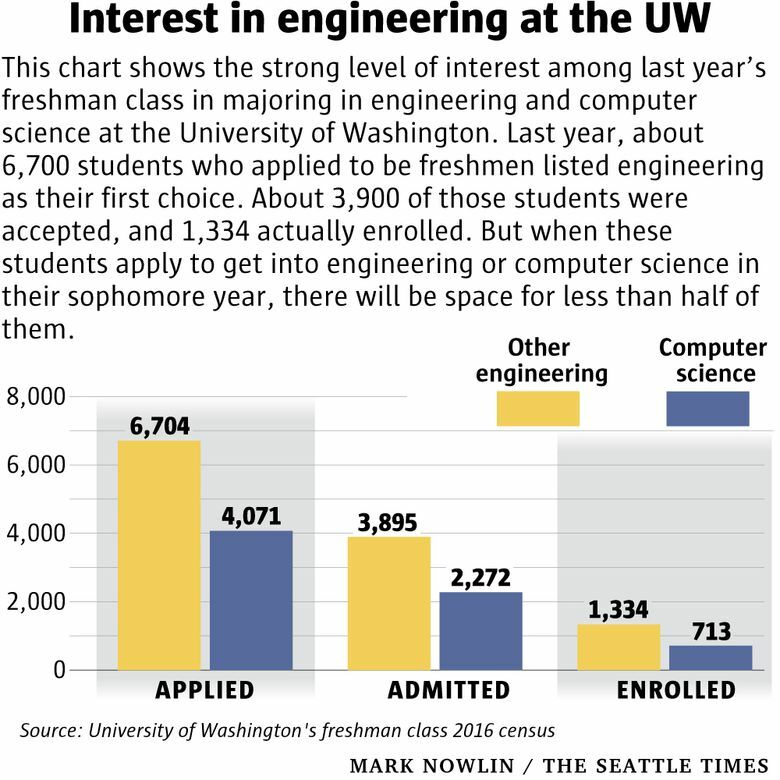 As it stands now, less than half of all UW undergraduates who apply to major in engineering get in, and an unknown number of others are discouraged from ever applying, said Michael Bragg, the college’s dean. The problem has been exacerbated in recent years by the popularity of the so-called STEM subjects — science, technology, engineering and math. That means that getting accepted into engineering can be a nerve-wracking experience even for top students. Right now, many students are afraid to take interesting — but challenging — courses that might bring down their GPAs, Bragg said. Those who get turned down are left scrambling to find a different major, rethink their college plans or transfer to another college. The change to the direct-admit process, Bragg said, will offer more certainty to incoming freshmen about their futures. It will take effect for the class of freshmen who start in fall 2018 — in other words, students who are high-school juniors today, and will be seniors applying to college this fall. The process is designed to ensure that about half the students who study engineering come in as freshmen who are directly admitted to the college. The other half will be made up of underclassmen who decide later to pursue the major, or who transfer to the UW from another school. Robaidek, who graduated from Garfield High in Seattle, chaired the college’s Student Advisory Council, which gave input into the direct-admission change. Ryan Carlin, a junior in materials science and engineering, also said that in his first two years at the UW, “much of the emphasis from the students was on getting a good grade rather than learning the fundamentals.” Carlin, who came here from New Jersey, was reluctant to get involved in undergraduate research, clubs and other activities, fearing outside interests would cut into studying time. Bragg, the engineering college’s dean, said directly admitting students is common practice at other engineering schools around the country. At the UW, most engineering students have been admitted to the major at the end of their sophomore years. Starting with the freshman class of 2018, the school will admit about 650 incoming freshmen directly into the college. The school is admitting more students than it can accommodate because it knows some will later switch majors. Students won’t be guaranteed a specific engineering major, but they’ll be assured a spot in one of the 10 majors offered. Many engineering disciplines overlap, Bragg said — for example, computer science and electrical engineering require many of the same skills and courses. The admitted students will be able to start taking prerequisites and learn more about the fields of engineering at the beginning of their college years, he said. At the end of their freshman year or during their sophomore year, they’ll submit “placement requests” to specific engineering departments. The UW has the largest college of engineering in the state. It awarded 810 bachelor’s degrees in engineering fields in 2015-16. The UW’s Paul G. Allen School of Computer Science & Engineering already fills about 20 percent of its majors from incoming freshmen, and that number won’t change. (Those students receive their degrees from the College of Arts and Sciences, rather than engineering.) The separate group of computer-engineering majors in that school receive their degrees from the College of Engineering, and will be subject to the new rules. Although the number of students who receive engineering degrees at the UW has gone up by 40 percent since 2009, Bragg said Washington still lags behind other high-tech states. In 2015, Washington graduated about 42 new engineering students for every 1,000 engineering jobs available in the state, making it 49th among the 50 states, according to a national survey. In civil engineering alone, there are 750 job openings in Washington each year, but only 350 degrees are produced here among all the schools that offer civil engineering, Bragg said. The UW has requested $16 million from the state Legislature to expand engineering programs, and an additional $1 million to plan new facilities. So far, the proposed House budget includes $6 million for computer science and computer engineering degrees, and the Senate budget includes $10 million for high-demand degrees. Bragg said the UW’s engineering college will aim to make its enrollment reflectthe overall enrollment breakdown of the university, in which 75 percent of students come from Washington, and the remaining 25 percent come from out of state or out of the country. Katherine Long: 206-464-2219 or klong@seattletimes.com.